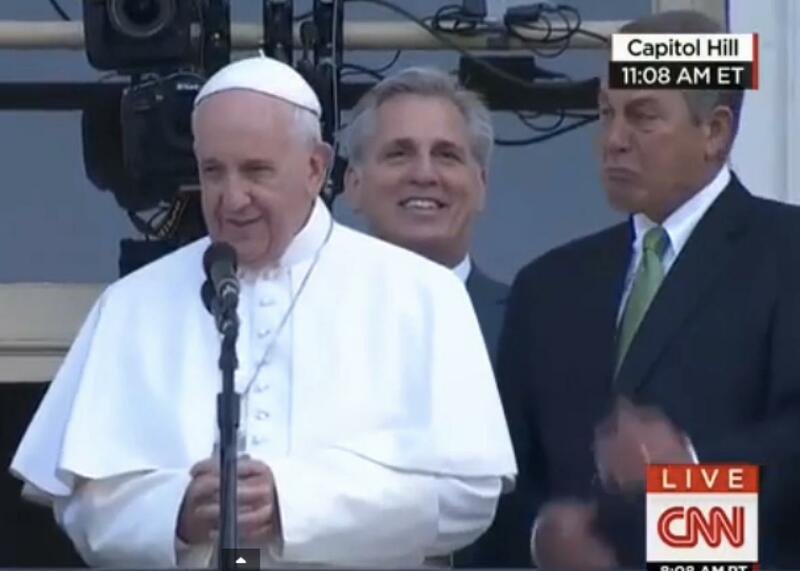 John Boehner and the Pope: The Speaker gets emotional in the presence of Pope Francis. A very endearing John Boehner, and some other guys. It was Speaker John Boehner, a lifelong practicing Catholic, who invited Pope Francis to address a joint session of Congress during his visit to the United States. Thursday’s speech was a big deal for him. And since the speaker of the House is known to enjoy a good cry, it was expected that he would bawl. The poor fellow, clearly moved, convulsed his face in extraordinary ways as he tried to keep it together through the speech and afterward on the speaker’s balcony. “@HowardMortman: pic.twitter.com/Fc0Kq2EMo0” Not gonna say a thing about Boehner crying b/c @donnabrazile & I were tearing up on @CNN set too. What a morning. Now it’s time for him to fund the government while somehow managing to keep his job! He’d better save some of those tears for later. See more of Slate’s coverage of Pope Francis’ U.S. visit.